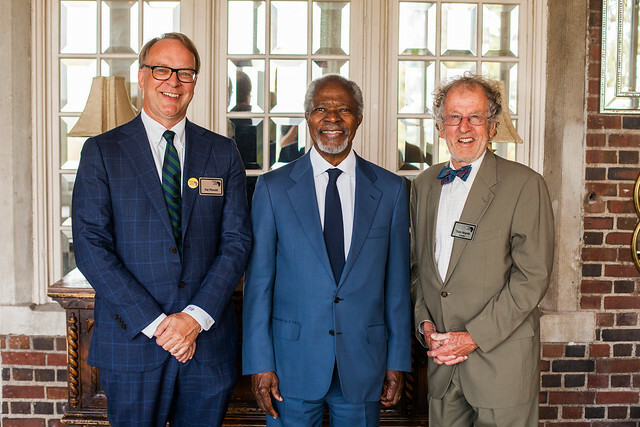 Books For Africa was thrilled to host a reception honoring former UN Secretary General Kofi Annan on May 7th, 2018. Over one hundred key supporters gathered at the University Club of St. Paul for the reception, which was held in recognition of the 30th anniversary of Books For Africa and the 10th anniversary of our law book program, the Jack Mason Law & Democracy Initiative. Mr. Annan spoke and answered questions for over half an hour, primarily on the topics of literacy and of rule of law. On education, he said in part: "Numerous studies have shown that no development tool is more effective than education and literacy. When people are able to access education they can break free from the cycle of poverty. This is why the on-going education and literacy crisis in Africa is such a serious concern. Over the past 30 years Books For Africa has made tremendous progress in helping to extend this right, and I urge you to redouble your efforts in the decades ahead." On the topic of rule of law, his remarks included this: The rule of law is fundamental for a healthy democracy, good governance and a prosperous society. No society can long remain prosperous without the rule of law and respect for human rights. I am therefore particularly pleased that, ten years ago, Books for Africa launched the Jack Mason Law & Democracy Initiative to further the rule of law across Africa. So let me thank Books for Africa and Thomson Reuters for establishing such a unique and successful program". Former Vice President Walter Mondale, co-chair of the Law & Democracy Initiative with Mr. Annan, attended and was also honored. Sharon Sayles Belton, Vice President for Government Affairs and Community Relations for Thomson Reuters, also spoke as did BFA Board President Jote Taddese, former Board President Rosemond Sarpong Owens, and BFA founder Tom Warth. Following the event, Mr. Annan wrote to thank BFA for 30 years of working to end the book famine in Africa. In his letter addressed to Founder Tom Warth, Executive Director Patrick Plonski, and Lane Ayres, Director of the Law & Democracy Initiative, Mr. Annan wrote “you are to be congratulated for the valuable work you have done over the last thirty years, and I am sure you will continue to make a much needed difference in the years to come.” See a copy of Mr. Annan's letter here. Mr. Annan was also honored by his alma mater, Macalester College, who renamed their Institue for Global Citizenship in his honor. You can read more about his visit in these articles from Mshale Newspaper, the Saint Paul Pioneer Press (article 1, article 2), and the Minneapolis Star Tribune (scroll to second half of article).